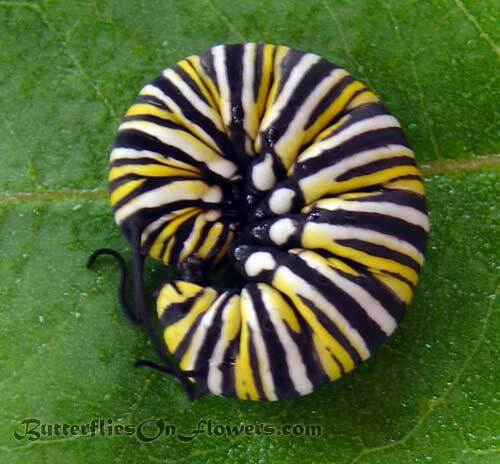 Caption: A monarch caterpillar assumes the defensive position by curling up into a tight ball. Unfortunately for the monarch larva, this is about the extent of their defense against predators. Many stay away because bright stripes indicate their toxic nature. However, that doesn't deter all enemies, and for those who scoff at potential sickness or death, these cats are ripe for the pickin'. I remember one evening counting 10 caterpillars ,all instar 3 or larger, lounging on our milkweed. The next day they were all gone...ill-fated victims to one or more ravenous predators. Playing possum isn't a very effective defense, hence the less than 10% survival rate from monarch egg to adult butterfly. Caterpillar Facts: The caterpillar feeds solely on various species of milkweed. However, that is not true of the caterpillar's first meal. When she hatches from her egg, she will promptly devour the nutrient rich shell.